Properties in Livingston Mall average 4.4 out of 5 stars. Townhouse in Heart of West Village, Walk to All! Property 18: Townhouse in Heart of West Village, Walk to All! Stunning West Village 3 Floor Townhouse - Your NYC Home! Property 22: Stunning West Village 3 Floor Townhouse - Your NYC Home! Sleeps 6 - 1 Bedroom - 1 Bath - 3 Beds - Parking Available - BBQ - Deck - Just 7 Minutes to NYC 220. Property 31: Sleeps 6 - 1 Bedroom - 1 Bath - 3 Beds - Parking Available - BBQ - Deck - Just 7 Minutes to NYC 220. Cozy West Village Townhouse w/ PRIVATE ROOFTOP! 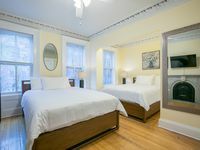 Property 32: Cozy West Village Townhouse w/ PRIVATE ROOFTOP! Sleeps 15! 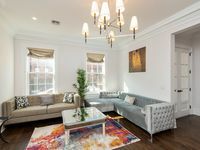 Luxury 4 Story Townhouse! Property 36: Sleeps 15! Luxury 4 Story Townhouse! 5BR Townhouse with Parking & Patio! Near Downtown! Property 46: 5BR Townhouse with Parking & Patio! Near Downtown! Our group of 9 ballet dancers and 7 moms had a wonderful stay at this home. So many bathrooms and beds worked well for our group! Victor was a terrific host and responded very quickly whenever we messaged him with our questions. We were so close to NYC, it was ideal for us. Super clean and beautiful, as pictured!! Would love to stay here again when visiting NYC. Thank you Victor! Enjoyed staying here very much! Was are first family trip to see New York city located in great location close to Path Station and was great neighborhood to walk around short walking distance to the Hudson river to get great pictures of Manhattan skyline day and night. Apt.Was very clean and comfortable to relax in after long day of walking around the city. Definitely exceeded expectations.